Madonna’s success has been, in part, because she reinvents herself regularly and a long time ago I understood the value of doing just that. I am a skater, now an inline skater and it is safe to say I am obsessed with it. That is not to suggest that from time to time my obsession has not waned, but it is safe to say that through divorce, death, depression and distance, I have skated every week since I slipped on a pair of Rollerblade TRS Lightenings in 1994. 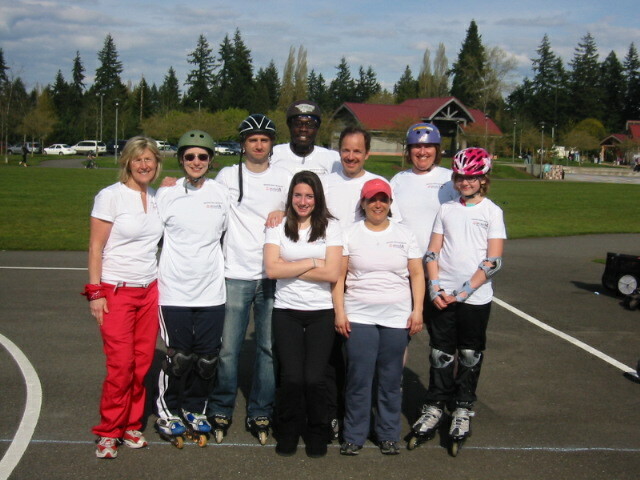 I started teaching weekly inline skate classes in 1996 and turned it into a school with other instructors in 2000. As such, I’ve had a reason to be on skates every week whether I wanted to or not. In the ensuing time my brother died of a brain tumor, my family of origin seemed to implode as a result, I quit my legal job (lots of money) to run the skate school full time (no money) and I had a vision of running classes at a rink no one could have dreamed up. I became depressed and because I was already manic and could do a gazillion things at once I became bi-polar. I enjoyed my therapy and managed to get my life into more of a dull roar than chaotic. I moved 200 miles away from the skate school to earn enough money to keep me out of bankruptcy and still made it to the rink every weekend. Okay, while I could go on as my adventures are many, suffice it to say that I fit into the category of obsessed with skating. I will write more stories explaining my journey later, most of them showing you that it was all truly fun, if you look at it right but for now I’ll try to stick to my topic: How do you reinvent yourself to keep enjoying what you’ve been doing for so long? Lucky for me there are at a minimum 9 different types of ways you can skate: hockey, indoor race, outdoor race, artistic, aggressive, urban skating/recreational skating, fitness-trail skating, slalom (and I’ll even include ‘sliders’ –hockey stops gone wild) roller skating (quad skating) and ice skating, to name a few. A few years ago, when I felt my heart did not trill enough when I skated, I attended an Eddy Matzger’s Roadshow clinic and again last weekend.) He offers a 16 hour on-skates clinic on how to skate faster using a special stride, the Quadruple Push (QP). I have skated a number of marathons so I am not unfamiliar with speed. I did not take his clinic to be faster, or even to get the QP, but rather, I love to skate in so many ways, that I just loved playing with the stride. It was fun to skate another way. It was just so fun, how could I not have an extra little ‘kick’ to my skating? I am, at my core, every fiber of my body, an artistic skater. So I took what I learned at the Roadshow and turned it into a dance. The QP is now a dance step for me. It’s modified, and not perfect, but I’ve got a new move. One of the ways my heart sings and I can cry tears of joy while I’m skating (happens all the time, it’s the darndest thing) is when I create something new. Likely all my moves have been done before but they are new to me and when I get them I go Weeeeeeeeeeeeeeeeeeeee either out loud or in my heart. This is a no-brainer. When you share what you love, like sharing a meal with a friend, you love what you do even more. In skating our community is small and so we need more skaters. Bringing more into the fold is creating community and you did it, you made a difference and that just feels good. At Skate Journeys (where I teach) we now have 24 skate instructors, 20 of whom learned how to skate at the school. That is a lot of community building and when you ask the instructors why they volunteer their time given that they all work full time jobs but show up to the rink every week for years, they always say they love to give back. Read: I’m not the only one who is obsessive. Eddy teaches skaters, those who already skate, how to skate better, including the Chinese National team of kids. He travels to China for several months and spends days and hours with these kids. They love him. No wonder he wanted to climb Mt. Kilimanjaro in skates and skate the Great Wall of China. He teaches others, he is so good at it and he does it for peanuts. It’s not the money, it’s the joy of teaching and sharing his passion. Read: I think he is more obsessive than me. I also own the company that teaches and certifies skaters how to become skate instructors in North America (www.skateia.org) and it’s always the same story: the new instructors are energized because during the certification process they learned how to be better skaters and they can’t wait to share what they learned with others. It’s a love fest at the end of the certification process-the new teachers are so happy for the journey, for their work and for spending time in the company of other like- minded and quirky, fun skaters. They don’t make an Energizer battery that can compete with their enthusiasm. It’s just easy to go back to Eddy on this one. I consider him, arguably, one of the best teachers I have ever met. He gives his time equally to everyone even if there are 25 participants. He gives more value than he asks for. He explains well and constantly the basics to his course. He is a consummate entertainer and it is easy to see his passion for skating and helping everyone learn. I think I am the queen of teaching, but when I take a class from anyone else I not only learn something I couldn’t teach myself, I get a lesson in downsizing my ego. Reinventing me, on and off skates is about moving away from myself and joining the community and letting go of my ego. Reinventing me is about a willingness to change and therefore grow. Reinventing me is about having more fun on my skates, allowing tears of joy to gently drip out while I am doing a new move and my heart is going Weeeeeeeeeeeeeeee. It is my hope, completely from my heart that this post will, in some way, help you to put a little extra kick in your skating, in any way you choose to skate. Trish, you are an inspiring writer, and I look forward to reading more of your journey here on this blog. You rock! Having the opportunity to read your blog today truly was a gift. While a non-skater, connecting with you was immediate as I read along while also connecting with myself and my own parallel journey of involvement/love for the martial arts… Your clarity about your relationship with skating (and community) helped me value our differences and ultimately our similarities as people. Call it a template, recipe or process – what you put forth I’m convinced helps lead to renewal, continued growth and joy (in any pusuit). My take in your writing is that we still have opportunity to “become” if we continue to look a little deeper… thank you for putting the “we” in Weeeeeeeee!